In the days following the arrival of our next Technical Alpha patch, you’ll be able to give your out-of-game progression a serious pick-me-up with the addition of Stimpacks. A Stimpack is a timed buff that will net you an additional 100% XP and 150% Gold for each match you complete while a Stimpack is active on your account. 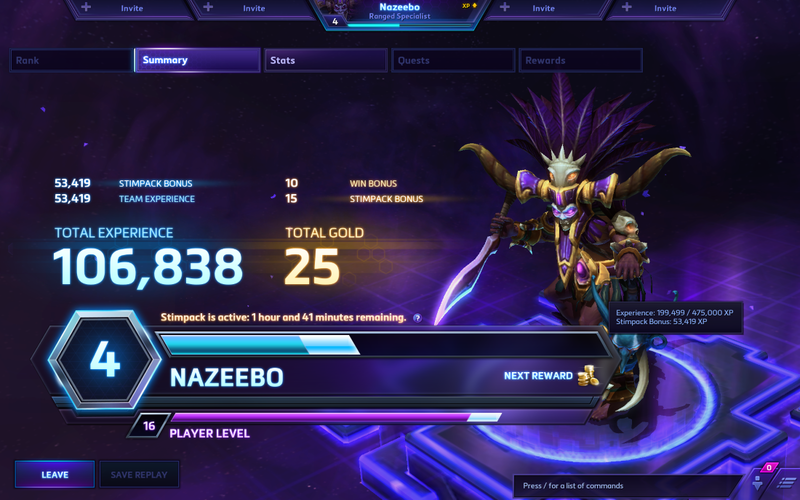 You’ll see a Stimpack’s bonuses applied on end-of-game score screens for each Heroes match you complete while it is active. If you’re ever curious about how much time you’ve got left before your Stimpack expires, you can always mouse over your selected hero in the Party Panel at the top of the screen to view the amount of time remaining. You’ll also be notified of your active Stimpack’s remaining duration in the Chat box upon logging into Heroes. A Stimpack’s XP bonus will only affect your out-of-game Hero and Player Level Progression, and has no effect on actual gameplay during a Heroes match. Stimpack benefits are additive. This means the bonuses they provide are added to the base amount of XP or Gold you receive by playing a game of Heroes. For example: Imagine you have an active Stimpack, and earned 100,000 XP and 30 Gold for winning your latest Heroes match. In this case, the Stimpack will award you with an additional 100,000 XP and 45 Gold, totaling 200,000 XP and 75 Gold for that game. Another example: Let’s say that you partied with a friend for the 50% Play with Friend XP bonus, and also completed a Daily Quest for 200 Gold during the winning game mentioned above. In this case, you’d earn a total of 250,000 XP and 275 Gold for that match. In order to pick up a Stimpack for your adventures in the Nexus, simply head to the Heroes of the Storm in-game Shop, and then click the new “Stimpacks” tab to view the options available to you. That just about does it for our primer on the addition of Stimpacks to Heroes of the Storm. Keep an eye on the official Heroes of the Storm site for more announcements from the Nexus, because our next patch is just around the corner!